There’s a new Ethiopian restaurant in Honolulu, and it’s called just that — Ethiopian restaurant — until a name is decided on. Along with not having an official name, it’s also in an unusual spot — tucked inside Takahashiya Ramen along Kapahulu Avenue and sharing the same kitchen. 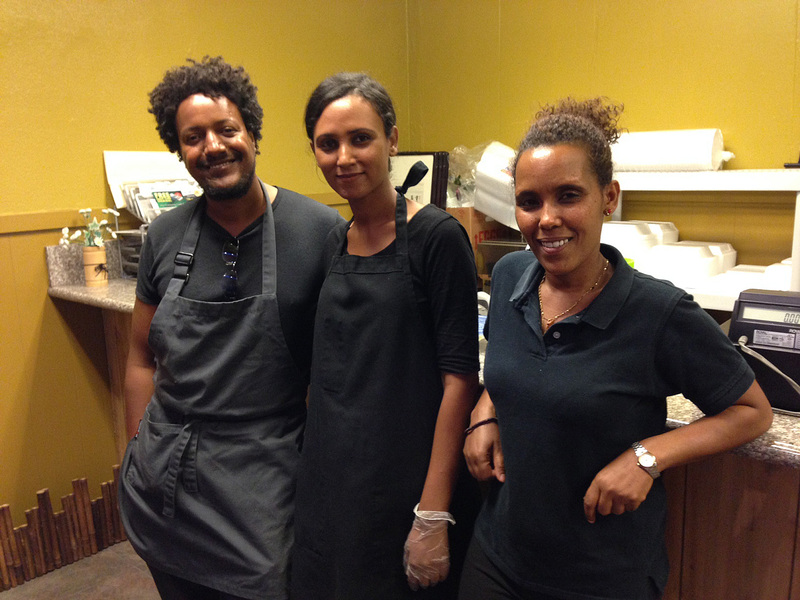 Yet despite such quirks, the arrival of Ethiopian cuisine on Oahu has stirred excitement. 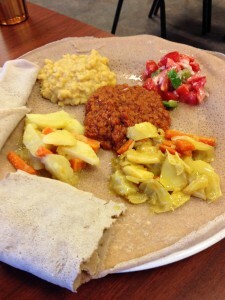 Yesterday evening, I stopped by the eatery, eager to try the savory lentils and vegetables I remember dining on while living in Los Angeles (near a strip of Ethiopian restaurants along Fairfax Avenue). As soon as I started posting Instagrams on @frolichawaii, the comments began: @patwill9: Totally trying this place; @queentobeeeee: Mmmmm this looks promising! I felt the same way when I learned about the May 17 opening of this restaurant from a Facebook friend, who posted photos over the long weekend. So on the way home from work, my daughter and I took a detour into Kapahulu. The set-up is a bit odd, but I like it. The dine-in tables are open to patrons of both eateries. While my daughter opted for gyoza and ramen, I went for the Ethiopian vegetarian combo ($14.95 for one person; $27.95 for two). The platter included red lentils spiced with red pepper sauce, yellow split peas, chopped cabbage and potatoes and carrots. The dish was lined with injera, a sourdough flatbread that’s spongy to the touch and used to pick up the food. 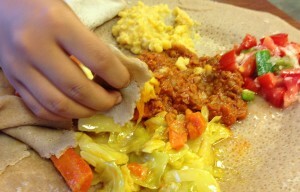 No utensils needed; I just tore off pieces of the injera and scooped up the veggies and more. Having just tried the combo, I cannot offer a review of the menu. But what I can say is that I enjoyed what I ate and will be back to try other things. The dish took some time to prepare, but I didn’t mind because I figured they were cooking everything from scratch. And it tasted as such. Although I’m not a vegetarian, I’m always looking for good meatless options. And this warm, hearty food comforted me with its flavors, spices and textures. The restaurant is owned and run by Abraham Samuel (the chef), Fay Shew and Etsegenet — family members from Ethiopia. So far, they haven’t done much to get the word out, because they’re still trying to assess how many people they can serve at once. They did tell me though that diners have been streaming in, learning of their place through word of mouth, and ordering the Awaze Tibs, cubed prime beef sauteed with thomato, onions, garlic and red pepper sauce. Other interesting options include the Kitfo (prime beef tartar with Ethiopian clarified butter and spiced chili powder) and the various versions of beef stew, served only on Saturdays and Sundays.